Once upon a time doesn’t have to be in the past. While fairytale castles may be more well-known in Europe, the USA is home to some spellbinding castles of its own. Whether you’re looking for a castle with spiraling turrets or never-ending stairways; castles perched on a clifftop or hidden in a forest, the U.S. has one for you. Take a look at our six favorite fairytale castles in the U.S. to inspire your own magical travel story. If you dream of a lavish hilltop retreat, Hearst Castle will not disappoint. Designed by California’s first female architect, Julia Morgan, the complex, completed in 1947, is a showcase of luxury and excess. Nicknamed ‘La Cuesta Encantada’, Spanish for "the enchanted hill", by its owner William Randolph Hearst, the castle is perched above the coastal town of San Simeon. The castle has an incredible 165 rooms and 123 acres of terraced gardens with fountains, pools and views galore. Built to emulate a European country home, the castle and grounds are home to Hearst’s legendary art collection. 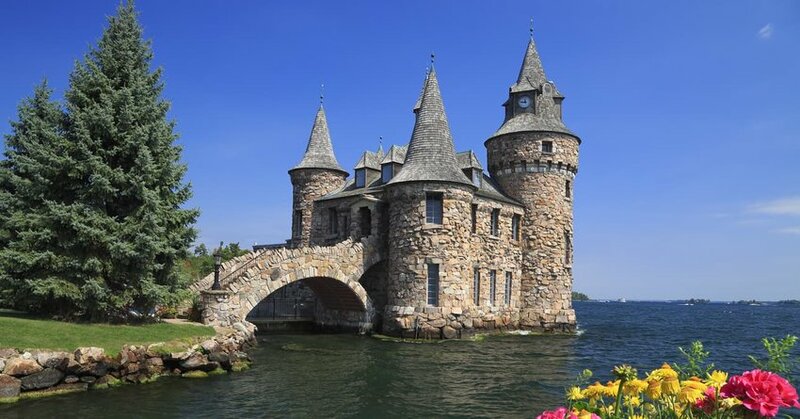 In true fairytale fashion, Boldt Castle has a tragically romantic backstory. It was built by rags-to-riches hotelier George C. Boldt as a tribute to his wife, Louisa. It was to be the summer home of their dreams, located in their beloved Thousand Islands region, on Heart Island no less. Construction began in 1900, but four years later tragedy struck when Louisa sadly passed away. Bereft with grief, George vowed never to return to the island, and Boldt Castle lay abandoned for over seventy years. In 1977 the Thousand Islands Bridge Authority acquired the property and has transformed the ruins. The castle is still fitted with period furnishing, and grounds include Italian gardens, a tower fortress, and a dove-cote - once home to a collection of fancy fowl. 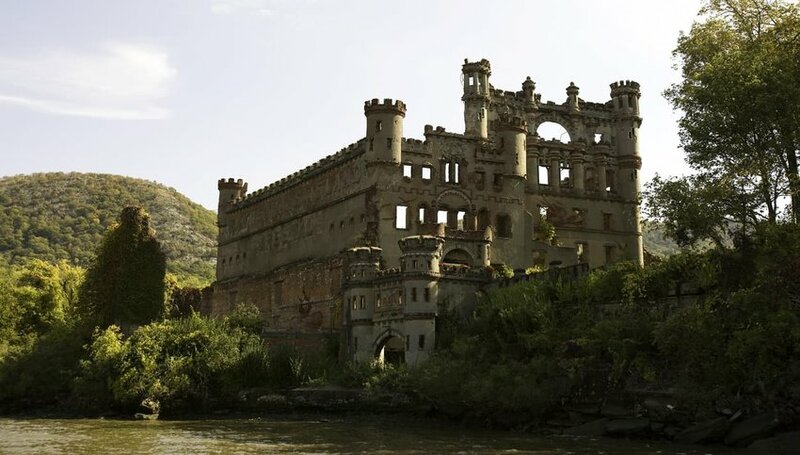 The ruins of Bannerman Castle are the sole remaining occupant of the tiny Pollope Island on the Hudson River. Previously uninhabited, the island gained a reputation based on fanciful tales of hauntings and superstitions. Then, in 1901, Frank Bannerman, a munitions dealer, purchased the island to build a fortress for his cargo. The castle was designed to echo the medieval fortresses of Scotland, his birthplace. Equipment and ammunition of all types were stored there until Bannerman’s death in 1918. The castle has since been slowly crumbling into the river, fighting off storms and even a raging fire in 1969. The castle is still open seasonally for visitors willing to risk the buried hazards, crumbling walls, and unknown ghosts. 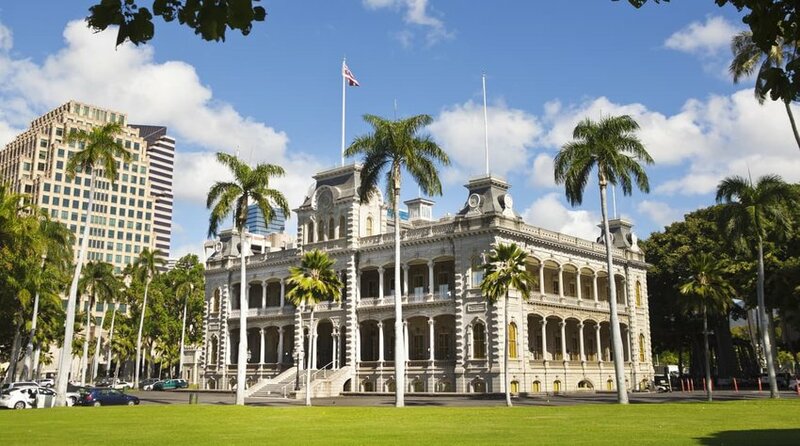 For a castle fit for a king, look no further than Iolani Palace in Hawaii. King Kalākaua built the palace in 1882 to equal the majesty of European castles he had seen on his global travels. He filled it with the finest furnishings, equipped it with the latest technology and made it his family’s home until the monarchs were overthrown in 1893. In fact, it's the only royal palace in the entire United States. The palace has since shifted purposes several times, serving as an executive building to a new republic, a prison to an overthrown queen and the headquarters for martial law. Today, Iolani Palace is a grand museum open for the public to walk its 7,000 square feet of wooden floors and revel in stories of days gone by. Hammond Castle sits high on a cliff overlooking the Atlantic Ocean. Built in 1926 by John Hays Hammond, Jr., inventor and art connoisseur, the castle served as his home and laboratory. The setting of a true European castle on the New England coast is as unexpected as it is intriguing. The castle houses Hammond’s unique collection of inventions as well as Roman, medieval and renaissance art. Hammond designed a gigantic pipe organ as the centerpiece for his Great Hall, which has been played by some of the greatest organists in the world. Meanwhile, the building itself has a dungeon, an armory and even a secret passageway out of one of the many bedrooms. For a more modern fairytale, Castello di Amorosa offers a taste of Tuscany to its visitors. 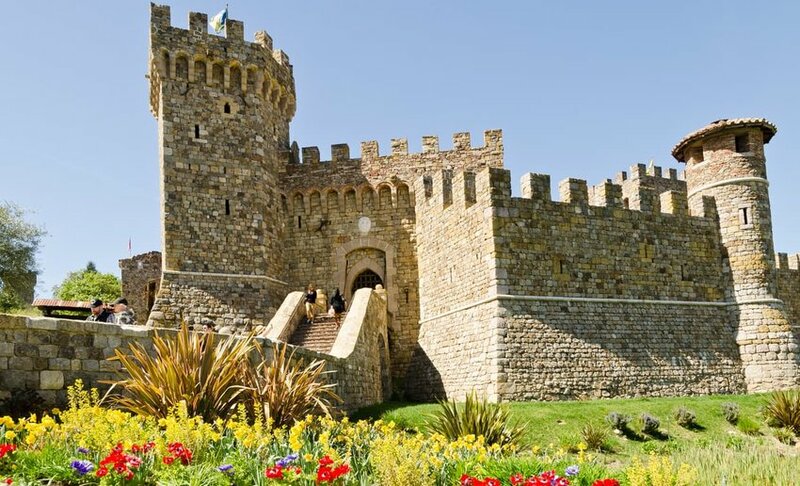 Built in 1994 by Dario Sattui, a fourth-generation winemaker, the building is the only authentic medieval Tuscan castle in the USA. The castle is nestled in the hills of Napa Valley amongst 170 acres of forest. The castle has over 90 rooms purely dedicated to winemaking and wine storage across eight levels, four of which are underground. Its enormous Great Hall displays Tuscan frescoes, while outside a drawbridge, dungeon and torture chamber leave plenty of room for active imaginations.